The continuing Israeli military incursions into Lebanon are perhaps of questionable morality and dubious benefit, not only to the Lebanese but to Israel herself. And while one might be hard put to find justification for the invasion, the amount of spin that John Balson puts on the actions and “ideals” of Hezbollah is far beyond and much more disingenuous than what any Israeli apologist would require. The Israeli invasion was indeed initiated by abduction of two Israeli soldiers in northern Israel, and also one in Gaza. By suggesting that Israel alone was preparing for an invasion, however, Mr. Balson ignores the fact that Hezbollah, with Iran and Hamas, had been planning the near-simultaneous abduction of the soldiers, most likely in order to draw the world’s attention away from the Iranian nuclear issue, and certainly to draw the world’s attention to what they knew would be perceived as an Israeli overreaction (Regarding the border, the EU, the UN and even Al Jazerra, no friends of Israel, agree the soldiers were abducted from the Israeli side). As for Israel’s preparation for an invasion of Lebanon, it is should be obvious why Israel’s military — one of the best in the world and who undoubtedly prepares for numerous contingencies — would have made prepations for a return across the UN-certified border from which they completely withdrew from in 2000, and from which they have been receiving Hezbollah rocket fire and cross-border incursions for six years. Israel’s disastrous 1982 invasion of Lebanon was indeed an attempt to put an end to the PLO’s control of southern Lebanon, and also it’s mounting of terrorist attacks across the border, which Lebanon was ostensibly, to use Mr. Balson’s term, powerless to stop. 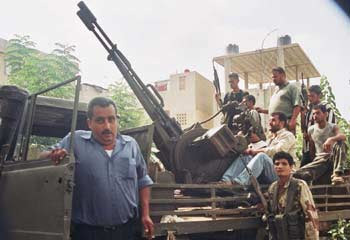 While the occupation achieved those goals, it created greater problems for the Israelis, which continued even after they escaped their quagmire of policing southern Lebanon in 2000. It had and has no desire to replay that disastrous and brutal occupation, and so the bizarre accusation, levelled with a misquoted reference to the Balfour Declaration and perplexing syntax, that Israel has from before it’s inception “coveted” Lebanon’s water and “vast resources” couples a misunderstanding of Zionism with an misconstruction of the current situation. One need not respond to the grasping suggestion that, because some of them gave up scholarships to study in the United States, Hezbollah are idealists, but the use of the term “idealist” itself requires a response. Hezbollah’s ideals, enumerated plainly in the manifesto that heralded its creation, include the creation of a Shiite-led Islamic state in Lebanon, the destruction of Israel, an unwillingness to even communicate with Israel (“no treaty, no cease fire, no peace agreements”), and the regard of all who do negotiate with Israel as traitors. All of these sentiments were espoused, contrary to Mr. Balson’s slippery wording, from the beginning of Hezbollah’s existence. Leaving aside Israel’s questionable responses for the moment, the Hezbollah military technique cannot be ignored in any discussion of the moral character of the organization. Their main military tactic is blindly firing rockets and missiles into Israel, with the hope of killing as many civilians as possible. If on some days they manage to fire 160 rockets at Israeli population centers and manage only to kill one or two Israelis, it says something about the quality of their Iranian-supplied weapons and their ability to aim, but nothing about Hezbollah’s will; ideally, each rocket would kill hundreds of civilians. 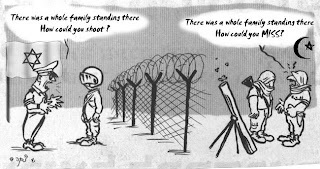 – There was a whole family standing there! How could you shoot? – There was a whole family standing there! How could you MISS? Mr. Balson’s strongest accusation, (on the Israeli military’s indifference to civilian deaths, or “collateral damage with no meaning”) would still be, if it were true, preferable to Hezbollah’s intended civilian deaths. And yet, however unwarranted the Israel responses might be, this assessment is demonstrably false. First, even in the most cynical study of Israeli goals must acknowledge that every civilian casualty on the Lebanese side is a PR nightmare for Israel. If world opinion is against Israel — and, USA Today not withstanding, it is against Israel — it is precisely because Israel has not been able to curtail civilian casualties completely. Israel has every self-serving reason to avoid civilian casualties. A more honest review of Israel tactics would acknowledge, however, the humanitarian steps Israel takes to limit both death and destruction, none of which Hezbollah would even consider: Leaflets are dropped to warn the civilians to avoid Hezbollah areas, and to evacuate certain areas that are to be bombed (a show of ethics that greatly benefits Hezbollah, as the terrorists then have forewarning of the attacks). Finally, the majority of the infrastructure (water, power) whose destruction would have helped the Israeli military and harmed Hezbollah has been left intact to reduce Lebanese suffering. In a reasonable appraisal, these Israeli tactics must be contrasted with Hezbollah’s storage of rockets in civilian buildings, clothing of combatants in civilian attire, and the firing of rockets and missiles from inside apartment blocks where immediate retaliation is all but guaranteed. It is, as Mr. Balson points out, a frustrating state of affairs when people draw their facts from the pro-Israeli sources alone. It also becomes a tragic acceptance of relativism if Hezbollah and the Israeli military can, in a serious conversation, be discussed as morally on the same planet. But the alarming proposition that Hezbollah are morally superior “idealists” foreshadows a black hole of willful ignorance from which, should our discourse be allowed to get sucked into it, our world will not be able to return.